Ueber die innere Architectur der Knochen und ihre Bedeutung für die Frage vom Knochenwachsthum. Journal : Archiv für pathologische Anatomie und Physiologie und für klinische Medicin ; vol. 50. Berlin : Georg Reimer, 1870. Description : 389-450 p. [3 l.] pl. ; ill.: 2 phot., 1 engr. (fold.) ; 23 cm. Photograph : 2 mounted collotypes (process unverified)—composites of 5 and 10 photographic figures. Subject : Femur — Biomechanics. Author caption: Von Dr. Julius Wolff, prac. Artze und Docenten der Chirurgie an der Berliner Universität. Army surgeon during the Franco-Prussian war, 1864-1866. Military service, 1870-1871, awarded the Iron Cross. Appointed privat-docent, University of Berlin, 1868. Assistant professor of surgery, University of Berlin, 1884. Founding chief surgeon of the Berlin University orthopedic dispensary, 1890-1902. Eponym: Wolff's law—changes in bone function are followed by changes in internal structure and mathematical attributes. Author (1892), Das Gesetz der Transformation der Knochen. Berlin: Hirschwald (vide: GM 641). Reference: Meyer, Georg Hermann (1867), Die Architectur der Spongiosa. Leipzig: "Archiv für Anatomie, Physiologie und wissenschaftliche Medicin" ; p. 615-628. Photo caption: Virchow's Archiv Bd. L. | Taf. X. [figs. 1-5]. Photo caption: Virchow's Archiv Bd. L. | Taf. XI. [figs. 1-10]. Photographer's name signed in the negative. Index Medicus: 10202351050, 11605361300, 20205461180. —Auch sind diese Präparate grossentheils durchsichtig, und lassen Vieles bei durchscheinendem Lichte erkennen, was sich bei auffallendem nicht deutlich genug markirt.—Endlich lassen sich von solchen Präparaten, namentlich, wenn sie—zur Erzielung eines scharfen Contrastes—auf eine Unterlage von schwarzem Sammet gebracht werden, die zierlichsten und saubersten Photographien anfertigen.—Page 393. The science of orthopedic biomechanics was established when the German structural engineer Karl Culmann (1821-1881) applied his stress models to the observations of internal bone structure made by Georg Hermann Meyer (1815-1892) during a lecture in 1866. 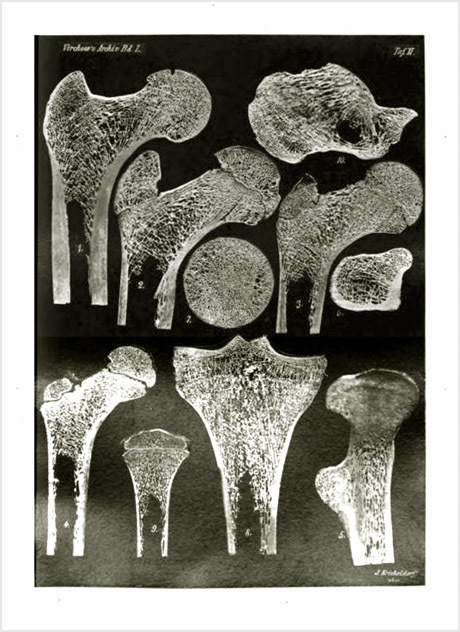 Out of this collaboration came Meyer's paper on bone structure (vide supra) illustrated with Culmann diagrams comparing the femur to a crane and beautifully illustrating the proposition that bone development uses the least amount of material for maximum function. Wolff believed that Meyer's paper did not get the attention it deserved and threw himself into the research of elaborating more fully Meyer's theory of bone development. To this end, Wolff also built on Culmann graphical statistics and introduced the fournier specimen, cut by a french steam-powered saw used in the manufacturing of ivory flats for women's fans (Damenfächer). He assembled a large collection of these slices and photographed a number of them on black velvet for the two plates illustrating this paper. Two years later he published a second paper that was also illustrated by photographic figures by Kricheldorff (vide intra »»).